The following article was written by British born journalist Tom Rogan. This opinion piece shows how British MI6 agents infiltrate the American Mainstream Media with the explicit intention of starting wars. The Brits have always been the most proficient at fabricating war propaganda. Ever since English became he dominant language worldwide, British propagandists have used it as a weapon to start all the major wars and other armed conflicts. That Rogan would even publish such a pathetic piece of war propaganda shows how desperate the British establishment is to goad America and the Ukraine into war with Russia. The Rothschild banking cartel always has the most powerful NATO militaries waging its wars across the planet. The next major war is the oft-predicted World War III which will also attempt to pit Germany against Russia, just like the last two World Wars did. Few understand that all of these global conflicts are a continuation of the Great Game between Great Britain and Russia. The $64,000 question, of course, is: Why is the UK so determined to conquer Russia? Russian President Vladimir Putin opened the Kerch Strait Bridge connecting Crimea, Ukraine, with mainland Russia on Tuesday. Putin did so by in a typical show of bravado by leading a column of transport vehicles across the bridge. Ukraine should now destroy elements of the bridge. While that course of action would be an escalation against Putin and one that would almost certainly spark Russian retaliation, this bridge is an outrageous affront to Ukraine’s very credibility as a nation. Of course, from Putin’s perspective that’s the whole point. 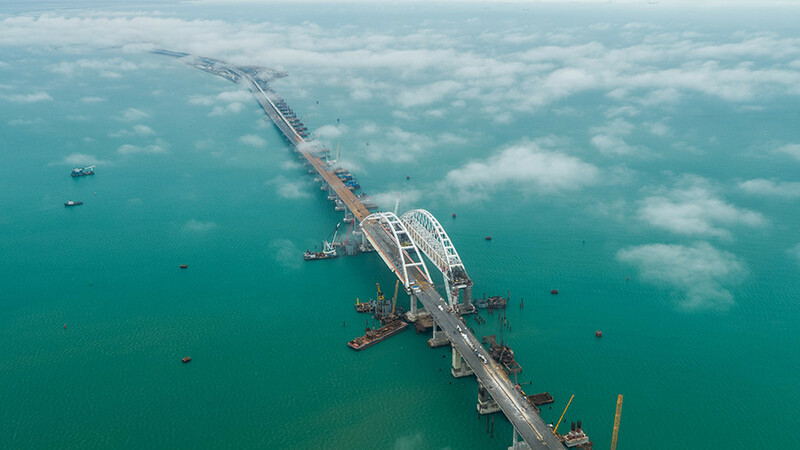 The bridge cost Russia’s near-bankrupt government billions of dollars, but it offers Putin a formal physical and psychological appropriation of Ukrainian territory. Probably with escalation against Ukrainian interests in eastern Ukraine. But that escalation is very likely coming in the next few months anyway, and Putin wants to slowly absorb Ukraine rather than conquer it outright (he doesn’t want to upset his soccer World Cup bonanza by inviting new diplomatic pressure). But severing the bridge, even if temporarily, would send an unmistakable signal from Kiev to Moscow that Ukrainians are unwilling to accept the comfortable formalization of Putin’s territorial theft. The Ukrainians could also fly low and circular to evade Russian (admittedly high-competency) air defenses. The U.S. could and should support Ukraine here with confidence in our own military power. Air strikes would also serve two other objectives: drawing attention to the cronyism behind the project (Putin’s favorite pet oligarch, Arkady Rotenberg, was given the construction contract) and challenging Russian nationalist narratives in language those nationalists understand. On that latter point, consider that many of the messages below the RT propaganda celebration of the bridge opening reference Putin’s masculinity and the nationalist supremacy of a greater Russia. Bombing the bridge would thus be a very personal rebuke to Putin’s ambitions and his propaganda narrative. Regardless, the exigent moral urgency of action is obvious. Any state that allows its territory to be stolen and then bound up with the thief has taken a step towards extinction.